Nicola Catena planted his first Malbec vineyard in Mendoza in 1902. His grandson, Nicolás Catena, is known as the man who revolutionized Argentine wine and introduced high altitude Malbec to the world. The Historic Catena Zapata vineyards are planted with the Catena family’s proprietary selection of malbec plants: the Catena Cuttings. Catena Alta Malbec is sourced from Block 18 of the Angélica vineyard, Block 4 of the La Pirámide vineyard, Block 1 of the Nicasia vineyard and Blocks 3 & 9 of the Adrianna vineyard. 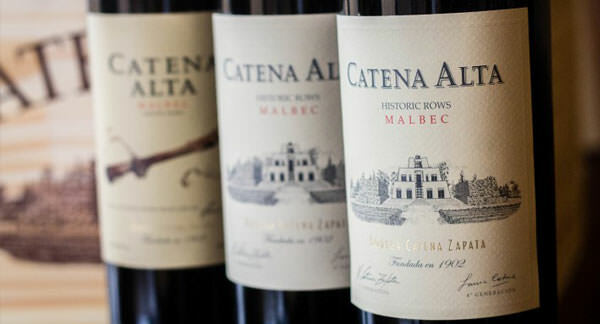 Catena Alta is an assemblage of historic rows within the Catena family Estate vineyards. The blend of these historic rows, like the marriage of sounds that create a symphony, yields a highly aromatic and elegant wine that speaks for the earth and the vines that have been tended by the Catenas for four generations. The Catena Alta wines can usually be drunk starting at three years after harvest and into the following one to two decades. Lot 18, Angelica Vineyard, Maipú, Luján de Cuyo (920m/3018ft). Aluvial origin. Loamy clay in the topsoil with rounded rocks on the bottom. Lot 4, La Piramide Vineyard, Agrelo, Luján de Cuyo (950m/3116ft). Aluvial origin. Clay topsoil with rounded rocks on the bottom. Lot 1, Nicasia Vineyard, Altamira, San Carlos, Valle de Uco (1095m/3592ft). Aluvial origin. Loamy soil, with rounded rocks on the bottom. Lot 9, Adrianna vineyard Tupungato, Valle de Uco (1450m/4757ft). Aluvial origin. Gravel and limestone. Rounded rocks in the bottom. Lot 6, Angélica Sur Vineyard, San Carlos, Valle de Uco. (1100m/3608ft). Sandy loam with presence of graveland limestone.